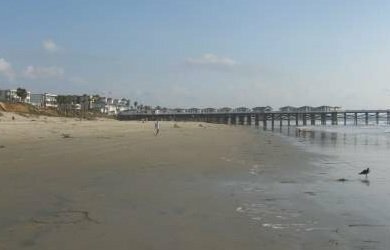 Find the perfect San Diego CA Beach Hotel in Southern California at a beautiful San Diego beach. Vacations in San Diego are memorable all times of the year, with the warm Mediterranean climate and 70 miles of beaches to explore. 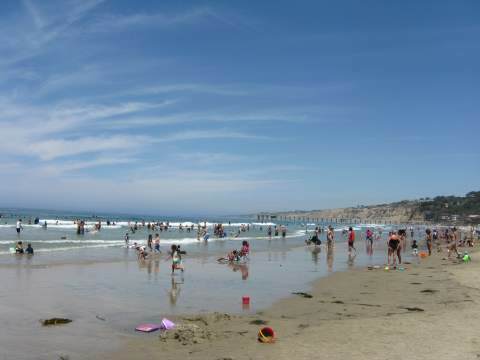 Here are some great picks for San Diego beach front hotels</b> in San Diego county from Torrey Pines south to San Diego. For San Diego beach hotels in north San Diego county, Oceanside to Del Mar, go to North County Beach Hotels. For more reviews of hotels in San Diego, check out TripAdvisor. Find top-rated hotels at the lowest prices on TripAdvisor. Check rates now! This beautiful 4 star hotel sits on the bluffs of La Jolla in Torrey Pines, and has spectacular views of the Pacific Ocean. The Hilton Torrey Pines is located next to the Torrey Pines golf course and Torrey Pines State Reserve. Nearby attractions include Birch Aquarium, Del Mar Racetrack, Torrey Pines Glider Port, La Jolla Coast Walk, and Black's Beach San Diego. They serve excellent buffet breakfasts in the Torreyanna Grill dining area. Sunday brunch is my favorite. this San Diego beach front hotel is popular for weddings because of the fantastic views, this is a very nice beach hotel in Southern California. The La Jolla Shores San Diego CA beach hotel is right on the lovely La Jolla Shores beach, one of the best San Diego area beaches with the clearest water in all of San Diego. Location, location, location makes this a great San Diego beach resort. You can enjoy the swimming pool, jacuzzi, in-room massage services, tennis, and of course the beach activities. La Jolla Shores beach has kayaking, snorkeling, scuba diving, and surfing, and is close to Scripps Pier and the Birch Aquarium. The hotel is right on the beach and you can dine at the beachfront The Shores Restaurant. This is one of the best San Diego beach front hotels, right on one of my favorite beaches and you are right where the action is for all the beautiful La Jolla beaches. If you are looking for the San Diego beach experience with a young and energetic crowd, Pacific Beach or PB is the place to be. Tower 23 Hotel in Pacific Beach San Diego, is a contemporary designed hotel that offers room types shows the essence of the hotel: spirit, sky, surf, sanctuary and sweet. Try the in-room couple massage, or sit on the tower deck and listen to the ocean breeze, watch the surfers or enjoy the sunset. Great romantic San Diego hotel with a spectacular view of the Pacific Ocean and Crystal Pier on the long stretch of sandy Pacific Beach. No swimming pool, but you are right on the beach. Lots of places to walk to and many local restaurants and bars, such as Kono’, 710 Beach Club Cass St. Bar and Grill for beer. This is a modern San Diego CA beach hotel and a great place to stay for a perfect Pacific Beach vacation. For a great San Diego beach getaway in Pacific Beach, choose the Blue Sea Lodge in SanDiego, one of the best of the San Diego beach hotels. The main attraction is beautiful Pacific Beach right in front of you, one of the best beaches in Southern California. With an oceanfront pool, great sunset views, Pacific Beach boardwalk, nearby restaurants and nightclubs, you have everything you need for some family fun in San Diego, or some exciting nightlife in PB. This is a great Pacific Beach hotel in San Diego CA. If you want to be where the action is, Pacific Beach in San Diego or PB is where you want to find one of the fun San Diego beach front hotels. The Ocean Park Inn is right on the beach and has a swimming pool, spa, massage therapy and continental breakfast. You can rent bicycles and enjoy the boardwalk, and of course enjoy the wonderful Pacific Beach and San Diego beaches. You can walk to the nearby restaurants and bars in PB. Non-smoking. No pets.